Abstract: Being fast and efficient is urgently needed in a city with a very fast pace of lifestyle. The first problem you need to solve is cramming into a bus during rush hour. Then you may begin to be tired of such life and work with no passion. Here Airwheel X8, a single-wheeled scooter comes. These problems can be solved immediately. Nowadays, one of the problems in our daily life is that many of us rush through the day. Hence, being fast and efficient is urgently needed in a city with a very fast pace of life style. The first problem you need to solve is cramming into a bus during rush hour. What’s worse, you may have to walk for minutes to arrive at your workplace even you have to clock off before 8 o’clock. Then you may begin to be tired of such life and work with no passion. Here Airwheel X8, a single-wheeled scooter comes. These problems can be solved immediately. 1. Being fast. On the one hand, Sony lithium battery is installed in X8 with stronger power and faster acceleration. The battery is featured by 1,800 recharge times, 3.8 times life expectancy and 2.9 times duration of ordinary lithium batteries without combustion or explosion. X8 is at speed of up to 18 km per hour with the load capacity of 120kg. On the other hand, 16-inch magnified wheel minimizes roll angle and optimizes grip effect. The unique design of wheel line makes the wheel wear-resisting and durable. 2. Being Furious. The electric unicycle X8 can bring you the feelings of passion. When you own an X8, you keep away from tiredness and always keep furious towards life. X8 adds colorful gasket outside so as to effectively protect your legs, and the phenomena of legs discomfort during cycling can be avoided. In order to meet different requirements, X8 has four colors available for your choice. Furthermore, when you adjust pedal height, your view will be different. When the pedal is higher, you will enjoy fresher air; when it lowered, you will have faster speed. You can adjust it at will. Riders can manipulate X8 to go forward, accelerate, decelerate, and brake, etc. by leaning forward or backward. 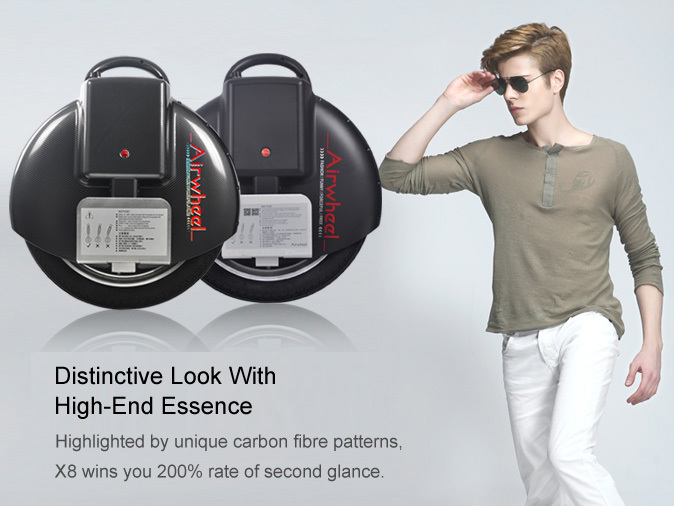 Owning an electric self-balancing unicycle Airwheel X8, we can go to more places in a leisure way. Moreover, we don’t have to face a lot of pressure, as well as many additional worries.